Dr. C. G. Brodie-Brockwell has written a 62-page booklet on the subject of why people who grind teeth get migraines. Diagnosing the causes of migraines and determining a healthy remedy has stumped the medical profession for decades but according to log-time Mississauga dentist Dr. C. G. Brodie-Brockwell, the answers are simple. A doctor of dental surgery for over 50 years until he retired two years ago, Brodie-Brockwell, 90, noticed that many of his patients complained of headaches during their visits. Brodie-Brockwell believes migraines can be attributed to the continual side-to-side movement of teeth in the upper and lower jaws  mandibular movements  and the subsequent grinding of the teeth. 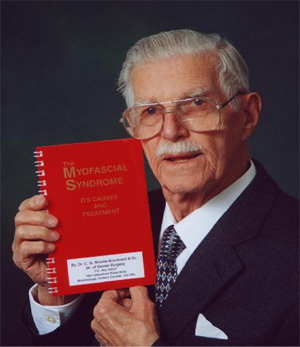 Brodie-Brockwell calls this the Myofascial Syndrome and wrote a 62-page book on the subject. Now he’s in the final stages of completing the sequel, titled Migraine: The Causes & Treatment as a handbook for the public. The books are the result of years of study for Brodie-Brockwell, who began his research when he started practicing in Lachine, Quebec in 1950. “It has been estimated that more than 50 per cent of the general public suffer from this ubiquitous condition,” said the native of Sidney, Nova Scotia who graduated in dentistry from Montreal’s McGill University. He lives in Lorne Park with his daughter Margaret Adshade, who helped him research and write his two books. Brodie-Brockwell developed a unique device that prevents the grinding of teeth while people are sleeping. His device allows your mouth to move from side-to-side at night while preventing the teeth from grinding on each other. "In every case, the problem was relieved or disappeared entirely," said Brodie-Brockwell, who received an Ontario Dental Association award in 1999 in recognition of his 50 years of treating patients. Brodie-Brockwell said the beauty of his migraine preventing device is that drugs aren’t needed. He said his findings have received a lukewarm reception at best in medical circles. He’s spoken at various dental conventions in Ontario and in the U.K.